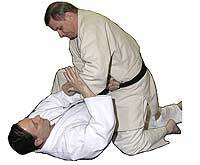 Being taken to the ground in a fight is a scary thing for most people, even the majority of martial artists, since few people have adequate ground skills. This article addresses the scenario of finding yourself on your back, and the attacker has dropped over your chest on one knee and is trying to punch you. If you don’t know what to do in this situation, you can be very vulnerable. Here is one defensive tactic for this situation. When the attacker is attempting a right punch to your face, you, the defender, can use a left hand slap to deflect the strike, something that also traps the attacker’s right hand punch. The trap is accomplished by pushing the attacker’s arm against his abdomen. 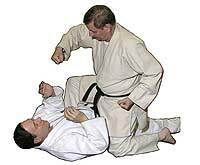 As the attacker’s left hand punches, the defender uses his right hand in the same procedure as above. At this point, both of the attacker’s arms are trapped (left over right). In this example the attacker is kneeling on his left knee and crouching on his right foot. The defender wants to throw the attacker to the kneeling side. As the defender bends his left foot towards his hip, he pushes off on that foot and at the same time lifts his left hip to his right front side. This throws the attacker off of the defender and to the ground. 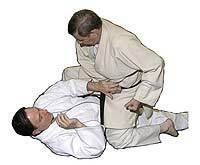 As the attacker is falling, the defender pulls his left hand free (the attacker’s hands are still trapped). The defender’s left hand can then strike the attacker’s face, or other targets (enough times) in order to get free, get up and exit the scene. The right hand is attempting to punch the defender's face. The defender's hand slaps the attacker's right arm to the attacker's waist (which traps the arm). As the defender's hand punches, the defender's right hand slaps the attaker's left hand to his waist (over the attaker's right arm). As the defender bends his left leg, his left foot and hip pushes upward to his right front corner. This throws the attacker to the ground. The defender's left hand punches the attacker.